Our next GA is 3 April 2019 @ 1200 (Lunch will be provided for 10 dollars. CPO Birthday Week kicks off this Friday! Here's a list of events and points of contact. April 5th, 0900 CMDCM McCreery's Retirement. 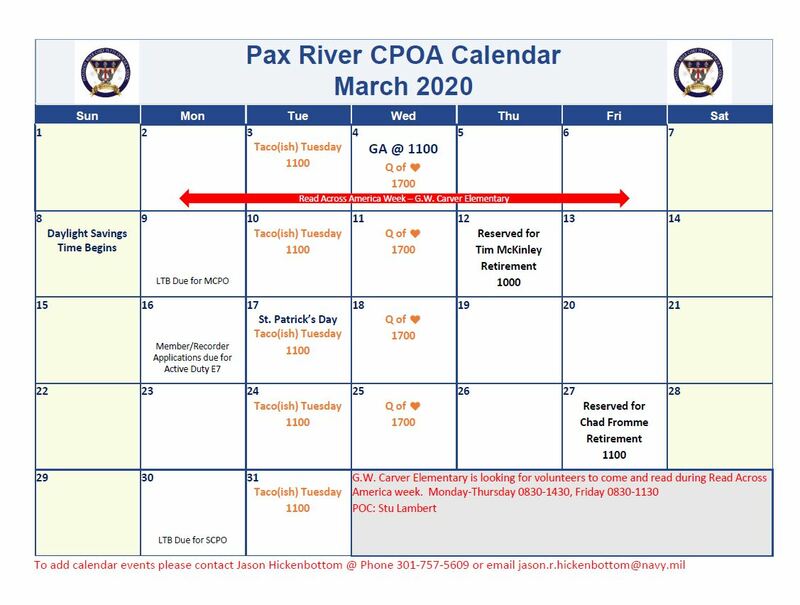 Please review calendars as we have a lot going on especially during the month of April. - Please come and use the CPO Club, it's there for us to use. Feel free to spend a little money, some great fellowship, and good conversation. - Contact Vice President for Calendar updates if you would like to add something to the calendar or make a suggestion! - If you are transferring or retiring within the next 90 days, please let the EXCOM know! Have something to say? Don't be shy... let it rip. Contact the EXCOM. Copyright © 1986-2018. All Rights Reserved.